Manutec presents a complete range of aftermarket replacement parts to suit Stubble King drills manufactured by AGPRO and PHM. 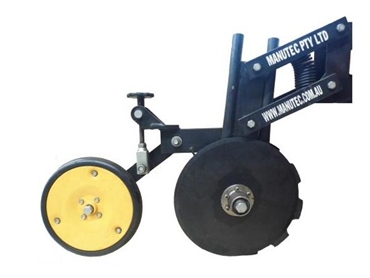 Manutec stocks the complete range of spare parts to suit and extend the operating life of Stubble King drills. The spare parts range includes scalloped disc, plain disc, large tension spring, single bearing hub, double bearing hub, hub bearings, hub washers, hub circlips, hub seal, hub nuts and bolts, disc scraper, seed firmer, left hand bolt – single hub, left hand bolt – double hub, right hand bolt – single hub, right hand bolt – double hub, washers and spacers, replacement handle, pivot bushes, weld-on thread sections, press wheel – complete, press wheel tyre, and press wheel bearing. Complete replacement units are also available. Manutec does not stock replacement seed boxes or flexible seed tubes at the moment.